(AFP) - Opposition leader Felix Tshisekedi was sworn in on Thursday as president of Democratic Republic of Congo, marking the country's first-ever peaceful handover of power after chaotic and bitterly-disputed elections. Tshisekedi took the oath of office before receiving the national flag and a copy of the constitution from outgoing president Joseph Kabila, stepping aside after 18 years at the helm of sub-Saharan Africa's biggest country. A moment of drama was injected into the ceremony when the newly-minted president was taken ill during his inauguration speech. After a 12-minute interruption, Tshisekedi returned to the microphone, saying: "A famous president of our country said in his time: 'understand my emotion'." He was quoting the dictator Mobutu Sese Seko, who said those words in 1990 as he was announcing the end of single-party rule. "The campaign we had to run... got the better of me," Tshisekedi added, apologising for the interruption as Kabila looked on impassively through his trademark dark glasses. The last two presidential elections, in 2006 and 2011 -- both won by Kabila -- were marred by bloody clashes. Fayulu branded the result a fix but lost a challenge to the Constitutional Court, and foreign support for his position ebbed. Among foreign nations attending the ceremony, Kenya and Zambia were represented by their presidents and Tanzania by its vice presidents, according to state television, while China, France, Japan and the United States sent their ambassadors, AFP journalists saw. 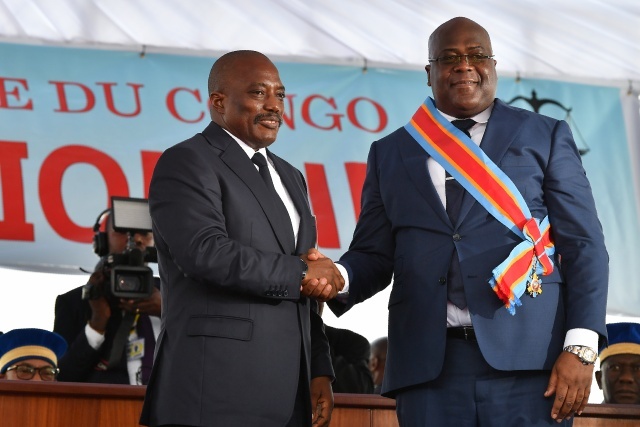 Tshisekedi took over the UDPS, DR Congo's oldest and largest opposition party, after the death of its founder nearly two years ago, his father Etienne. Analysts say the new president faces a raft of pressing problems. According to a "political coalition agreement" seen by AFP which outlines an arrangement for "power-sharing" between the FCC and Cach, the position of prime minister will be rotated every five years. Very little of the wealth trickles down to the poor. It ranks a mere 176th on the 189-nation Human Development Index compiled by the United Nations' Development Programme (UNDP).